From liquor to stone crushing, monopolies flourish in Punjab as party leaders run the state like a ‘private limited company’. Take liquor. Till 2002, liquor distribution in Punjab was in the hands of myriad entities. The industry had distilleries on top, a bunch of wholesalers in the middle, and hundreds of small businessmen running liquor shops – or thekas – at the base. Revenue department officials at the district level used to auction wholesale and theka licences, said a businessman who used to own liquor stores in Amritsar. In every circle, the administrative subset of the revenue department, there could be as many as 12 thekas. The format for choosing wholesalers was different. According to a former wholesaler who like the retailer spoke on condition of anonymity, anyone could apply for a wholesale licence. Till the early 2000s, each district had several wholesalers – as many as 20 in some. This structure first weakened under the Congress regime. In 2002, shortly after his appointment as chief minister, Amarinder Singh gave a state-wide wholesale licence to liquor baron Ponty Chadha – effectively, his company had a monopoly over the sale of liquor in the whole of Punjab. According to Verka, the next four years saw men hired by Chadha wage war against homebrews, and against people who brought in liquor from neighbouring states (or the Union Territory of Chandigarh) instead of buying it in Punjab. They would, says Verka, “raid marriage halls and parties to check whether the alcohol had been brought in Punjab”. In 2006, with state elections around the corner, says Verka, the government ended Chadha’s contract. The liquor business reverted to the circle model with multiple wholesalers in every district. In 2007, the Akalis came to power and, a year later, began to consolidate the liquor business again. This time, says the former wholesaler, the government brought down the number of wholesale licences to just two for every district. As the number of wholesalers fell, their ability of the remaining wholesalers to put pressure on distilleries and retailers increased. “Distilleries were told to offer higher trade discounts and longer payment periods," he said. "Stores were put under pressure by slashing trade discounts and insisting on immediate payments." Of the two wholesalers, one was usually an old player, the other one was a new entrant allegedly known to the Akalis. This split averted complaints of monopolisation. But, according to the former wholesaler, the new entrant called the shots: he would sell most of the stipulated quota and the holder of the renewed licence could sell the rest. In their conversations with Scroll, the wholesaler, the retailer and Verka said five individuals and their families control over 80% of the liquor trade in the state. 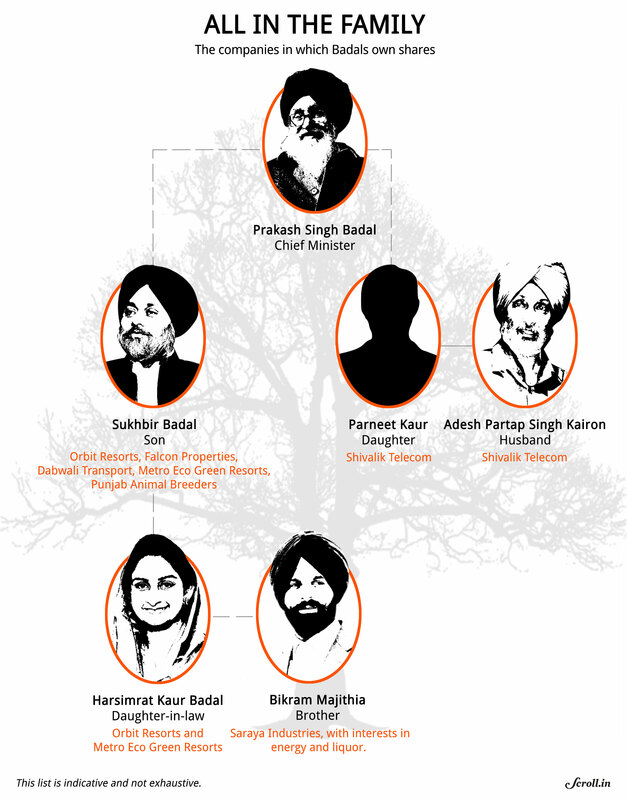 Of them, at least three have direct links to the Akali Dal. 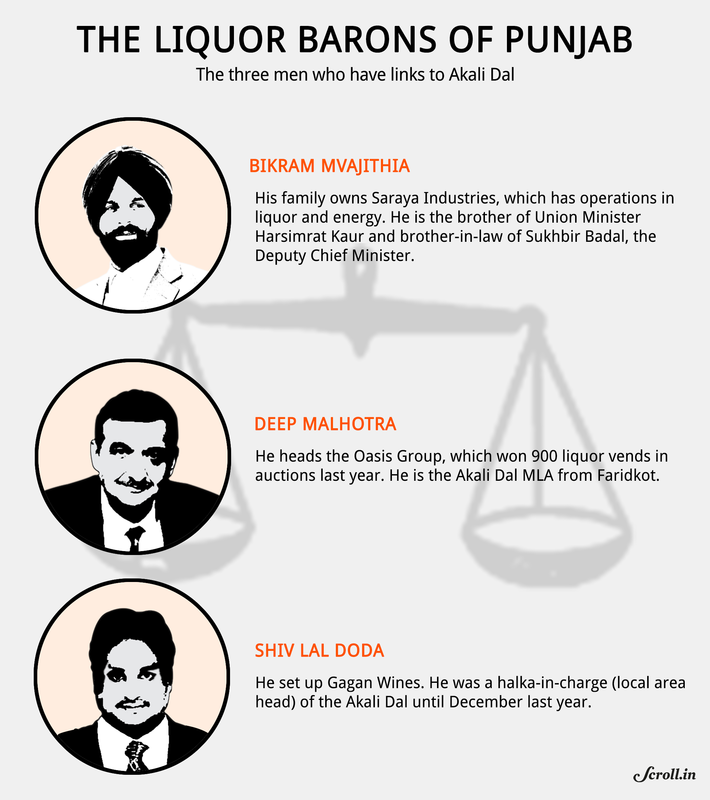 Deep Malhotra heads the liquor-manufacturing Oasis Group and is the Akali Dal MLA from Faridkot. Shiv Lal Doda set up Gagan Wines and was the halka in-charge (local leader) of the Akali Dal in Abohar. Questions sent by Scroll to the state government asking it to respond to these allegations remained unanswered. If the liquor business saw smaller companies elbowed out by a few large ones, the stone quarrying business played out to a different pattern. Here, the industry structure stayed the same, but an outsider came in and took away most of the margins. Punjab’s quarrying industry is concentrated in a few districts. Rivers such as the Ravi are a major source of stone. 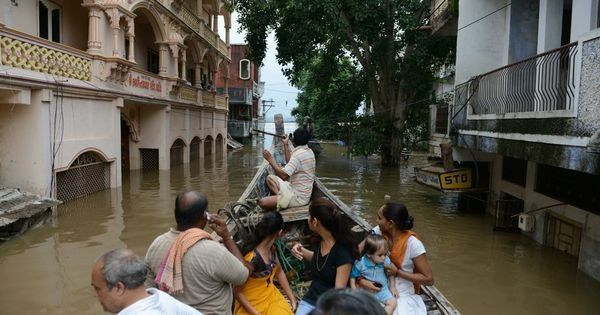 When it rains, says the owner of a crushing plant near Pathankot, “The Ravi swells as wide as 3 km. When it recedes, it leaves behind boulders on the fields of farmers.” This annual phenomenon created a crushing industry in two districts near the Himalayas – Pathankot and Gurdaspur. Apart from this, crushers also operate in districts that have rocky outcrops and hills, such as Ropar. Crushing too is a fragmented industry, thanks to the low costs of entering the trade. A crushing unit, the businessman points out, costs no more than Rs 1.5 crore. Till 2007, plots for riverine crushing were awarded through auctions. Successful contractors collected the stones deposited by the river, crushed them and heaped them up in large piles. The construction industry from Amritsar and elsewhere bought its requirements from these mounds. The market price of a tractor trolley-load of crushed stone was Rs 700-Rs 800. Similarly, in Pathankot, says his petition, the quantity permitted by regular auction would generate only six days’ work for 400 crushers. People in the villages near Pathankot say stone crushing never really stopped after the central government order. Travelling through the area, it's clear that crushers are working relentlessly, and stone-laden trucks plying hectically. Villagers living near Pathankot say that more than a thousand trucks travel along these roads every night. This was verified separately on a visit to a crushing unit at Kathlour near Pathankot. There, workers were matter of fact about the source of the raw material. “From the river,” a worker said. “Mining continues,” said the quarry owner. “It is just that now the stones are shown as coming from Jammu and Kashmir.” He claimed that crushers can now mine and transport their stones only on the payment of Rs 500 per tonne to a local called Kuldip Singh Makkar. 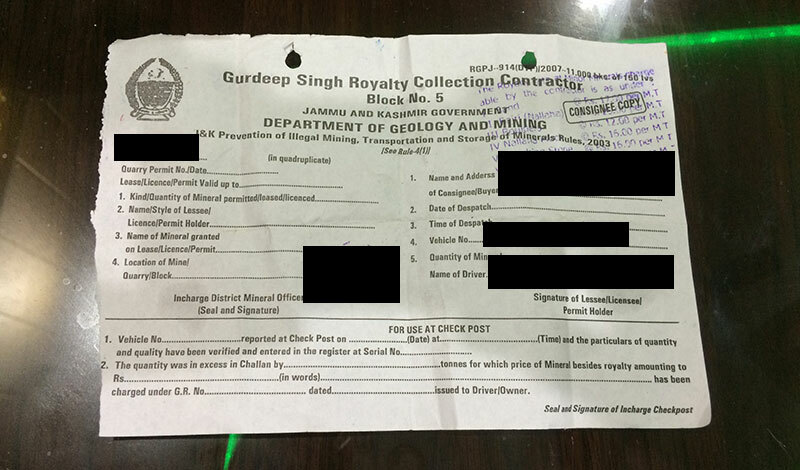 “On paying this money,” said the owner, “we are given J&K ki parchi” – a document which attests that the stones being transported are from Kashmir and, therefore, legitimate. Kuldeep Singh Makkar, the local who is allegedly collecting levies from quarry owners, is the brother of Akali Dal MLA Sarabjit Singh Makkar. On being asked why he was being named by people in the local industry, he said: “I run a legal crusher and I complain about those doing illegal work. Hum chori ko pakadwatey hain. I get the illegal operators arrested. And that is why people doing illegal work are trying to defame me.” As for the PIL, he says, these are joothi writs, false writs. His brother, he added, has no role in this business. “Woh is kaam mein nahin hain. Lena dena hi nahin hain," he said. He is not in this line of business. However, Kuldip Makkar’s claims about the lack of illegal mining are challenged by local reporters and businessmen in the crushing industry. Questions to the state government did not get a response. A similar process, where a handful of people cornered most of the business (or value) from an industry, occurred in bus transport and cable distribution. Then, there is cable distributorship. As in the rest of India, the cable business started in Punjab around the first Gulf War, with a bunch of entrepreneurs rigging up dish antennae in streets and neighbourhoods. These were small businesses, feeding as few as 500-600 households and subsisting on monthly subscription fees and local advertising. As it happens, Fastway too has a Badal connection. 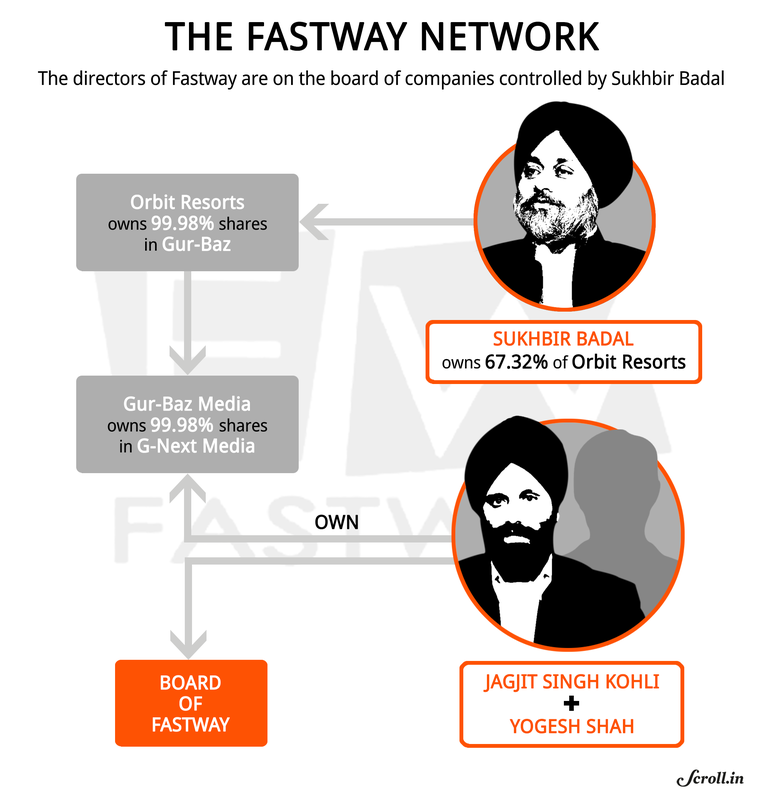 Between 2010 and 2015, Jagjit Singh Kohli and Yogesh Shah were directors on Fastway’s board. Their names, incidentally, also show up in the statutory filings of Sukhbir Singh Badal’s two media companies – Gur-Baz Media and G-Next Media. G-Next owns the PTC Group of television channels. In 2014, Gur-Baz owned 99.98% shares in G-Next. Orbit Resorts owned 99.98% shares in Gur-Baz. 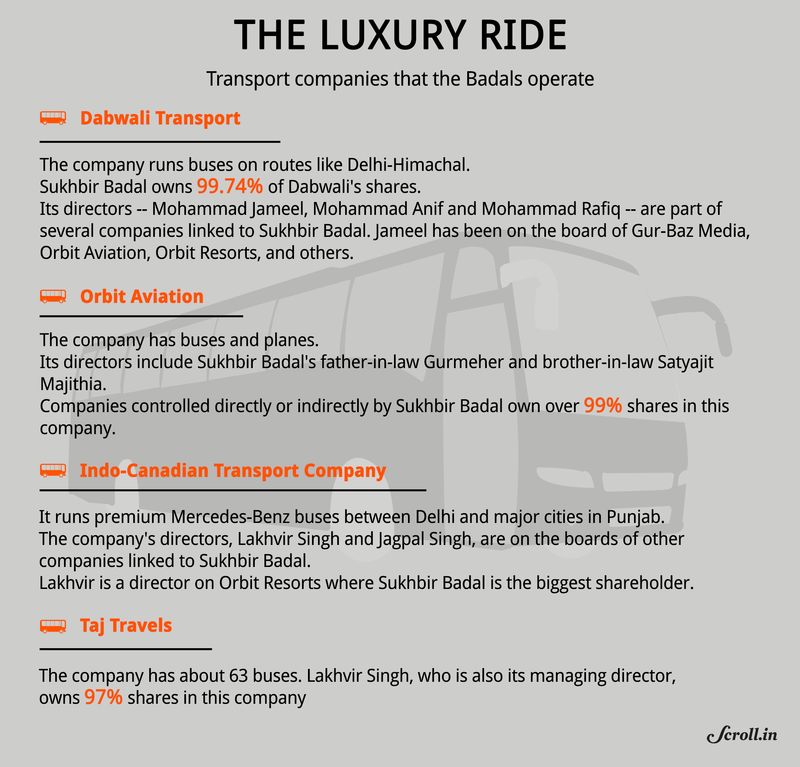 Sukhbir Badal owned 67.32% of Orbit Resorts. For a politician or a party, each of these industries would have a different attraction. Stone crushing, sand mining and liquor distribution throw up a lot of cash. The control of the media allows propaganda. And buses, says Master Mohan Lal, a former transport minister with the Akali government, become profitable as the scale of the business rises. Scroll contacted the state government asking it to respond to these charges. There was no response. What does this centralisation mean for Punjab? The visible damage is that many small companies operating in these spaces have been squeezed out. But the real damage goes way beyond that: as the Akali’s links to major industries grow deeper, the state is increasingly lackadaisical about collecting taxes from these industries. To make up for the revenue shortfall, it has stepped up taxes on other industries, forcing many businesses to exit the state. Punjab, he said, is losing revenue from all three. In excise, for instance, Lakhanpal estimates that half the alcohol sold in Punjab is illegal. Therefore, if the state earns Rs 5,000 crore from excise, then it is losing an equal amount. Scroll contacted Anurag Verma, the current commissioner for excise and taxation, but Verma did not respond. Former Excise Commissioner A Venuprasad denied there is any excise loss at all. This is yet another reason the state exchequer is bleeding. As Punjab favours the luxury bus segment through tax structures and favourable time-slots, the state’s public transport companies suffer. The dividends they pay the state government have gone down. Or, finally, take stone crushing: when the majority of stones crushed and sold in Punjab is passed off as coming from Jammu and Kashmir, the state gains no royalty. The 2012 petition filed in the High Court estimates annual profits at Rs 10,000 crore. If proper auctions were held, most of that value would have come to the state. At the same time, say people in the construction industry, the prices of both sand and stone for end-customers have gone up considerably after the Akali Dal came to power, which they attribute to the rent-seeking by associates of the ruling party. Abhijit Sen, an economist and former member of the erstwhile Planning Commission, agrees. The ruling party, he alleges, is growing by strangling the state. Besides these manifest issues, there are others just beneath the surface. The last few years have seen the state government also give contracts to two business groups, both owned by Sukhbir Badal’s two brothers-in-law. The first, Saraya Group, has interests in energy and liquor and is owned by Bikram Majithia, the younger brother of Harsimrat Kaur, Union Minister and Sukhbir Badal’s wife. The second, with interests in telecom, farm inputs and electrical equipment, is owned by Adesh Partap Singh Kairon, who is married to Sukhbir Badal’s sister Parneet Kaur. When the state government enters into business deals with these companies– for instance, when it chooses the Saraya Group to set up co-generation energy plants for cooperative sugar mills, or awards telecom and farm contracts to Kairon’s companies, it might be violating the Peoples’ Representation Act. Or take the PTC television channels, which is owned by Sukhbir Badal’s company G-Next. As this report in Firstpost says, the network got government ads worth Rs 78.32 lakh between 2007 and 2008. This was at precisely the time “when it [the PTC Network] had just been launched, and needed financial support,” says the article. In effect, Parkash Singh Badal’s government has sanctioned ads to a TV channel owned by his son, and awarded contracts to companies owned by his son-in-law. While working on this article, detailed questions were first emailed to Parkash Singh Badal, Sukhbir Singh Badal and Adesh Partap Singh Kairon. Bikram Majithia was texted a question when Scroll.in could not find his email address. Five days later, when there was no response, consolidated emails (with questions for all four leaders) and later faxes were also sent to Jangveer Singh and Harcharan Bains, media advisors to Sukhbir Badal and Parkash Badal, respectively. Subsequently, these questions were also faxed across to the offices of Parkash Singh Badal and Sukhbir Badal, and to Bikram Majithia and Adaish Kairon. Long-term observers point out that the lines between business and politics were never so blurred, even during previous reigns of the Akali Dal. So why now? The growth in the younger Badal's net worth puts most conventional investments to shame. In 2004, when he stood for Lok Sabha elections, he and his wife – current Union Minister for Food Processing Harsimrat Kaur Badal – pegged the value of their assets at Rs 13 crore. In 2007, when he contested state elections, the couple’s assets stood at Rs 67 crore. Seven years later, in the run-up to the 2014 Lok Sabha polls, Harsimrat Kaur Badal declared joint assets of Rs 108 crore. That’s a rise of Rs 95 crore over 10 years. An eight-fold increase in 10 years. In contrast, a person who invested, say, Rs 1 lakh in fixed deposits in 2004, would have seen a 2.3-fold increase – not factoring in taxes. Strikingly, while the fortunes of the Badals and Akali Dal leaders have gone up, the state’s welfare delivery systems have been gutted for want of money. The next story in this series looks at how the Akalis managed this transition – without drawing protests from the bureaucracy or the people.